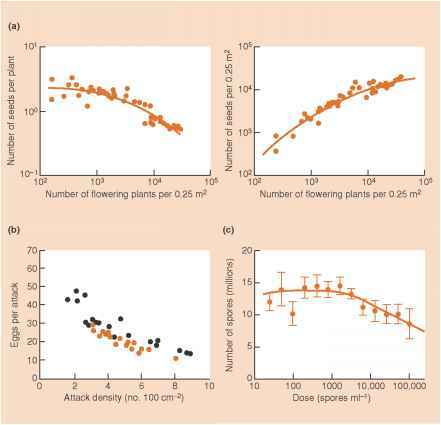 prey at low densities can increase in abundance virtually irrespective of predator density, and that the prey zero isocline will therefore rise vertically at low prey densities (Figure 10.11a). This could lend considerable stability to an interaction (Figure 10.11a, curve (i)), but for this the predator would have to be highly efficient at low prey densities (readily capable of maintaining itself), which contradicts the whole idea of a type 3 response (ignoring prey at low densities). Hence, curve (ii) in Figure 10.11a is likely to apply, and the stabilizing influence of the type 3 response may in practice be of little importance. On the other hand, if a predator has a type 3 response to one particular type of prey because it switches its attacks amongst various prey types, then the population dynamics of the predator would be independent of the abundance of any particular prey type, and the vertical position of its zero isocline would therefore be the same at all prey densities. As Figure 10.11b shows, this can lead potentially to the predators regulating the prey at a low and stable level of abundance. Figure 10.11 (a) The prey zero isocline is that which is appropriate when consumption rate is particularly low at low prey densities because of a type 3 functional response, an aggregative response (and partial refuge), an actual refuge or because of a reserve of plant material that is not palatable. With a relatively inefficient predator, predator zero isocline (ii) is appropriate and the outcome is not dissimilar from Figure 10.7. However, a relatively efficient predator will still be able to maintain itself at low prey densities. Predator zero isocline (i) will therefore be appropriate, leading to a stable pattern of abundance in which prey density is well below the carrying capacity and predator density is relatively high. (b) When a type 3 functional response arises because the predator exhibits switching behavior, the predator's abundance may be independent of the density of any particular prey type (main figure), and the predator zero isocline may therefore be horizontal (unchanging with prey density). This can lead to a stable pattern of abundance (inset) with prey density well below the carrying capacity. prey as relative densities change (especially red foxes, badgers, domestic cats, buzzards, tawny owls and crows) and of specialist bird predators (especially other owl species and kestrels) that, being wide ranging in their activity, switch between alternative areas. In both cases, predator dynamics would be effectively independent of vole abundance, adding stability to the system in the manner of Figure 10.11b. In fact, Hanski et al. were able to go further in constructing a simple model of prey (voles) interacting with specialist predators (mustelids: stoats and weasels) and generalist (switching) predators. Their general contention was supported; as the number of generalist predators increased, oscillations in vole and mustelid abundance (which may or may not be the basis for the vole cycle) decreased in length and amplitude. Large enough densities of switching generalists stabilized the cycle entirely. 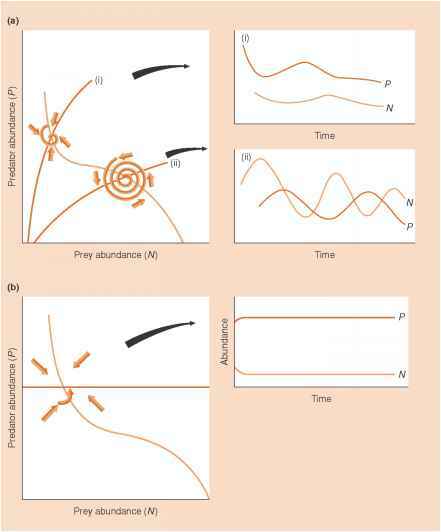 Figure 10.12 The possible effects of a prey isocline with a 'hump', either as a result of a type 2 functional response or an Allee effect. (i) If the predator is highly efficient, with its isocline crossing to the left of the hump, then the hump can be destabilizing, leading to the persistent oscillations of a limit cycle (inset). (ii) But if the predator is less efficient, crossing to the right of the hump, then the hump has little effect on the dynamics: the oscillations converge (inset). isocline crosses to the right of the hump, then the population dynamics of the interaction will be little affected; but if the isocline crosses to the left of the hump, then the outcome will be persistent rather than convergent oscillations, i.e. the interaction will be destabilized (Figure 10.12). However, for a type 2 response to have this effect, predators would have to suffer serious reductions in their consumption rate at prey densities far below those at which the prey themselves suffer seriously from competition. This is unlikely. The potentially destabilizing effects of type 2 responses may also therefore be of little practical importance. 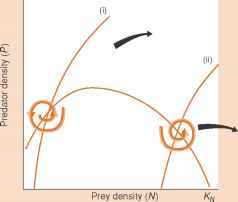 A destabilizing Allee effect has not apparently been established for any 'natural' predator-prey interaction. On the other hand, when we ourselves are the predator (for example, with exploited fisheries populations), we frequently have the ability (i.e. the technology) to maintain effective predation at low prey densities. If the prey population also exhibits an Allee effect, then the combination of this and persistent predation may all too readily drive a population towards extinction (Stephens & Sutherland, 1999; and see Section 15.3.5). That is, our isocline may cross that of the prey well to the left of their hump.